Oops - we don't appear to have a video for the DR-C120. User-friendly by design, the front panel operation of the DR-C120 makes it easy to stop, start and resume scanning with a touch of a button. You can conveniently initiate a frequent scan job from the ‘Start’ button – which not only saves you time but also ensures accuracy as all settings are already pre-defined for the scan job. The compact DR-C120 provides versatility where desk space is at a premium with a three-way tray design that lets you scan with the eject tray either open, closed or half-open. No matter the document type, a robust feeder mechanism ensures optimum feed and separation reliability – even when scanning mixed batches of thin and thick documents together. 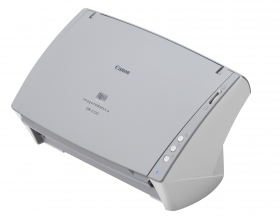 The versatile DR-C120 is also capable of scanning business cards, ID cards, 3m long documents and even A3 documents (in folio mode). Supported by intuitive image processing features, the DR-C120 requires little preparation for scanning mixed documents – just stack and scan! With features such as automatic document size detection, colour detection and deskew you get perfect image results every time. To make it easier, simply select the full-auto mode feature to automatically apply the best scanner settings based on document content.